There’s something really great about waking up and having breakfast ready, isn’t there? That’s probably why I love overnight oatmeal recipes so much (although, I usually fry up an egg to go with them…but that only takes a couple of minutes). You guys really loved the overnight coconut oats recipe, and guess what? SO DO I. I make it several times a week. Lately I’ve been getting creative and trying some new ovenight recipes (that I will be sharing with y’all here, of course). 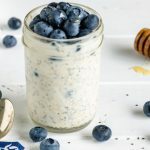 This 21 Day Fix Blueberry Overnight Oats recipe, created by Chellie from Art From My Table, is quite possibly my newest favorite – and I think you’ll love it, too. Place oats, milk, honey, yogurt, chia seeds, vanilla extract and 2 tbs of blueberries in a jar. Stir well. Cover and refridgerate overnight. Add remaining blueberries and serve immediately. Here are your 21 Day Fix container counts: 1 yellow, 1/4 purple, 1/3 red, 1/2 orange. 1 tsp (note: I usually fry up an egg to make it 1 red). I think you’re going to love these overnight oats. I *know* you’re going to love waking up to breakfast already made! Join me on Facebook for 21 Day Fix recipes, free printables, and helpful budgeting and meal planning help! Also, be sure to check out the posts below – I think you’ll like them if you’re looking for 21 Day Fix breakfasts! Mmmm you’ve reminded me I have yet to make overnight oats yet this summer. I need to get an that! I love them! I have them several times a week. What size mason jar do you use for this? These recipes look really great! Thank you for sharing. 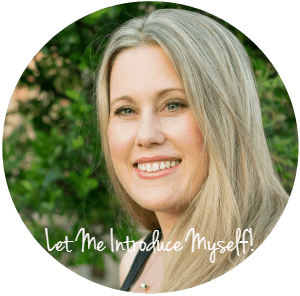 Glad I found your site through the linky! Yes, absolutely! I have done that many times. Does anyone add protein powder as well?! You could definitely add protein powder! It will change the taste, but you absolutely can.